Arjun's comment on Sonam's picture proves he is an ardent fan of Mindy Kaling. 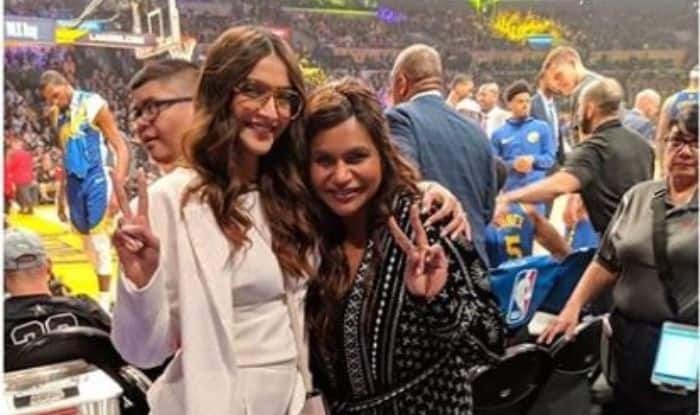 Sonam Kapoor and Anand Ahuja are having a merry time discovering Los Angeles. The duo attended their first Lakers game where they ran into American actress Mindy Kaling. The actress couldn’t stop herself from clicking a picture with her and as soon as she shared it on social media, her brother Arjun Kapoor had his fanboy moment. He commented on Sonam’s picture letting the world know of his excitement. This also shows Arjun’s bond with his sister. Meanwhile, Sonam and Anand are having a gala time in LA. From visiting bookstores to museums to searching for vegetarian-friendly restaurants, their pictures are all over the internet. There is no denying the fact that they are head over heels in love. On the professional front, Sonam is gearing up for the release of her upcoming film, Ek Ladki Ko Dekha To Aisa Laga. The movie is directed by Shelly Chopra Dhar. It also features Anil Kapoor, Rajkummar Rao and Juhi Chawla in crucial roles. It is all set to hit the screens on February 1. She will be seen sharing the screen space with Dulquer Salmaan in The Zoya Factor. On the other hand, Arjun was last seen in Namaste England with Parineeti Chopra. He is currently occupied with the work of Panipat. Along with Arjun, the film also features Sanjay Dutt and Kriti Sanon in crucial roles.